Having the right work surface can make a huge difference when you're completing sewing projects. You can buy pre-made sewing tables from craft stores and sites like SewingTableShop.com, but to create a truly useful space and save a little money, you may prefer to make your own table or modify an existing piece to your specifications. Either way, you're sure to end up with a sewing table that's tailor-made for your needs. You don't have to be an expert woodworker or have a serious budget to make a sewing table, especially if you start with an existing piece of furniture. This is a perfect option if your sewing space will be in a shared room and will need to blend in with that room's décor. It's also a great way to give your sewing table that personal touch without having to buy lots of expensive tools or supplies. Purchase a four-foot length of butcher-block countertop, available at home stores and Ikea. Choose a piece that is sturdy and flat. For easier maneuvering, select a piece that is one inch thick. Choose a small dresser, nightstand, or file cabinet that is 30 inches in height. Be sure this piece has plenty of storage for notions and sewing tools. Paint this piece in your desired color. Buy a set of two sturdy, 30-inch table legs from your home center or Tablelegs.com. Paint the legs to match the cabinet. Purchase two metal L-brackets, and attach one to each leg. Lay the butcher-block top face-down on the floor, and mark where you would like to drill holes to attach the L-brackets of the legs. Drill the holes, and use screws to attach the legs to the underside of the butcher-block top. Flip the countertop over so it is standing on the two legs, and rest the other side on top of the cabinet. Be sure to leave at least 24 inches of clearance for your legs as you sit at your sewing table. Then remove all the drawers from the cabinet, and have a helper hold the butcher-block top in the desired position. Reach into the cabinet, and pre-drill holes for your screws from underneath. Screw the countertop to the top of the cabinet, and replace the drawers. Don't forget to add decorative drawer hardware. Purchase and install drawer dividers and organizers to keep track of all your sewing tools. Select an old bookcase from a thrift store or from your own home. Remove the second shelf from the bottom. Adjust the shelves so that one is approximately 30 inches off the ground. Reinforce this shelf with 2x4 lumber. Paint the whole bookcase in your favorite color, using fun wallpaper to line the back, if desired. Purchase two table legs, and paint them to match the bookcase. Choose legs that are sturdy, and install a metal L-bracket on each one. Purchase a one-inch-thick, four-foot-long section of butcher-block countertop. Lay the countertop face down. Using screws, attach the L-brackets of the two table legs to the corners on one of the short sides. Attach the other end of the countertop to the reinforced shelf of the bookcase, using screws. Store your sewing machine on the bottom shelf, and use bins and baskets to organize your sewing supplies on the upper shelves. If you're handy with the table saw and drill, making your own sewing table from a set of woodworking plans may be the perfect option for you. Most plans give information about the level of experience required, so you can find a plan that matches your skills. 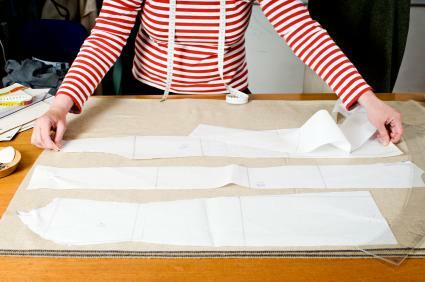 You'll likely find that your sewing experience comes in handy when it comes to cutting pieces, reading instructions, and visualizing the final product. Rockler Woodworking and Hardware has plans for a fold-out sewing work surface with lots of storage space. Keepsake Quilting offers a plan that includes a stow-away ironing board and lots of shelves. Amazon.com sells a plan for building a corner sewing table with a fold-out surface. Country Corner Crafts has a plan with an optional lift mechanism for your sewing machine. How much space do you have? It's always a good idea to buy or make the largest sewing table you can afford and store. You can never have too much workspace. Where will the table be located? Tables in shared living spaces may need to look like high-end furniture, while dedicated craft room tables can have more of a cute workbench look. How much storage will you need? Keeping your table organized is essential, so look for plans that feature drawers or shelves for supplies. Which sewing-related activities will you perform here? If you do a lot of sewing, you may need room for a regular sewing machine, a serger, an ironing board, a cutting space, and lots of fabric and supplies. Will you need a portable table? If you can't leave your sewing table up all the time, look for a design that is foldable or has casters for easy movement. Will you be using this table for other crafts? If so, you'll need space to store your sewing machine when it's not in use. Making your own sewing table gives you lots of control over the design and layout, and the Internet is an excellent resource for sewing table plans. Give some thought to your needs and limitations before selecting your plans, and you'll end up with a sewing table that is perfect for you.